Inside Syria Media Center’ sources report on personnel changes and on the renewal of ISIS leadership. Senior officials in hiding are trying to optimize the management of their structure and continue to carry out illegal subversive activities in a number of countries. 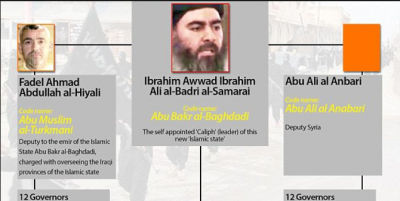 According to the sources, ISIS leadership is still under Abu Bakr al-Baghdadi. The representatives of ISIS military council are Iyad Abdulrahman al-Abadi, who is known as Abu Saleh al-Haifa, and Abu al-Harith Bashar Ismail al-Jarjar. For all the security issues Iyad Hamid Khalifa al-Jamili, known as Abdulrahman Ansari, and Abu Ali at-Turkmeni from Turkmenistan known as Abdul Bin Waheed Bin Khader Bin Ahmad are responsible. One of the high-ranking field commanders is Mustafa Sat Marim al-Nasr, also known as Masib As-Suri. The coordinators and official representatives, as well as spokesmen of the radical group, are Abu Hajir al-Sufi and Abu Hasan al-Muhajir. Besides, Abu Salah (Mustafa Mohamed al-Jarmusch) runs the financial management of ISIS. There are also a number of specific posts in the jihadi caliphate. For example, Abu Muhammad is in charge of all the prisons on the IS-controlled territory, and Abu Saji, known as Khairi Abd al-Khumud at-Taiami, is responsible for the social policy of the jihadists. Abu Shimaa, also known as Faris Riyad al-Naimi, is engaged in all the kinds of weapons supplies while a citizen of Tunisia Tariq bin al-Tahar bin al-Falih al-Awni al-Harzi, known as Abu Umar al-Tunisi, is in charge of the operations with the use of suicide bombers in Syria. According to some sources, he wasn’t killed in a U.S. drone strike at Shaddadi in north-eastern Syria on 16 June 2015, but this has not been confirmed yet. In addition, Abu Qasim, known as Abdallah Ahmad al-Mashhadani, oversees the meeting from abroad and training of new militants, as well as the brainwashing of the suicide bombers. The chief editor of IS affiliated ‘Dabiq’ magazine, Ahmad Abu Samra, is engaged in propaganda and interaction with mainstream media, and the social engineering and the organizational engineering in Twitter is conducted by Mahdi Saidi. Subversive activities are concentrated in the hands of Abu Amr al-Kardash and his assistant for distant mining is Abu Amr al-Malcum. It is also noticed that the ISIS economy is concentrated in the hands of the Minister Haydar al-‘Abadi (Ahmad al-Salih) and his deputy named Abu Hazma. ISIS emir in Western Kalamun is Muafik al-Jarban Abu as-Sus, and in the south of Damascus is Abu al-Dahman. Military operations in the south of Syria are led by Abu Samir al-Urduni, Jordanian by nationality. The sources also report that the head of the ISIS-affiliated Jaysh Khalid ibn al-Walid Army in the south of Syria is Nadir al-Zeyab (Abu Ali), and her military leader is Abd al-Karim al-Misri. That might be kind of weird for you to run accidentally into the above-mentioned FB-accounts when searching. Be prepared to see the photos of quite respectable citizens. Unfortunately, it is too far from the reality. The latest Inside Syria Media Center’ investigation of the so-called “White Helmets” FB-accounts showed that they are playing a double game on Facebook often disguised as everyday people. The more so, some of the high-ranking radicals managed to survive, although, in the U.S. reports they appear killed as a result of drones’ attacks or coalition’s airstrikes, eyewitnesses report. Does a mock take place here? It seems a conspiracy is prepared. You may be quite surprised to know that some high-ranking militants like jackals have fled recently to the territory of neighboring Turkey, Lebanon and Iraq at the first sign of threat against their lives. Many of the terrorists managed to deceive their allies on jihad. Together with their family, they took along their bloody looted property leaving the rest of the radicals to the mercy of fate. Among the most famous militants who took advantage of the situation, are the head of the so-called ‘Islamic Police’ in the province of Deir-Ezzor, Mahmoud Jaber Haij Rujuk, known as Abu Al-Jude, as well as Abu Laidan al-Iraqi responsible for the city of al-Mayadin. The others include the IS Minister of Agriculture, Abdulrahman Akal al-Araf (Abu al-Haras) along with his father, and the Secretary-General for Real Estate in the province of Deir-Ezzor, Abu Hazif al-Dashish. At the same time, the information about some previously appointed commanders remains unclear. It is known, for example, that the head of intelligence in the province of Deir Ezzor, Abu Firas Ash-Shahil, and his assistant have not been able to cope with their duties. But their fate is unknown at the moment. Many known ‘White Widow’ Sally Jones was responsible for suicide operations in the province of Raqqa. She was close to the border between Syria and Iraq when was allegedly killed by a U.S. drone strike in Syria in June 2017. This ‘office’ as well as many others in ISIS structure are vacant now or have been ‘reduced’ as a result of the Syrian Arab Army’s successful activity. Furthermore, there are no such positions as ‘a person responsible for Deir-Ezzor defense’. This position was earlier occupied by now escaped Ahmad al-Dunham and Abu Didjan al-Zor. Some more ranks unavailable now like ‘a person responsible for the Tunisian detachments in ISIS’ and ‘a person responsible for al-Bukamal defense’ were held by Syrian Saddam al-Jamal. Such posts like ‘responsible for the security in Deir-Ezzor’ occupied by Iraqi native Abu Tawfiq al-Iraqi, as well as ‘responsible for finances in the province of Deir-Ezzor’ occupied by Abu Arif al-Iraqi were also relegated to the dustbin of history with their chiefs fled. It seems that ISIS days are numbered. The Syrian Arab army with the help of its allies broke the back of the powerful earlier structure and is now finishing off its remains. No personnel changes or other transformations in its ranks can help ISIS to rise from the ashes. The scattered ISIS-Islamists are still present on the Syrian soil, but they will have been dealt with in the end.